In a new development of what may become an vigorously-pursued issue by several governments, the Australian government is deciding whether Catholic priests should be required to report when someone has confessed child sexual abuse during Confession. Proponents say that such a move will help to bring pedophiles to justice. The Australian Conference of Catholic Bishops has strongly opposed this measure as a forced violation of Church sacred doctrine and as a measure particularly aimed at the Catholic Church, since predator priests are likely to reveal this crime in Confession. If the Australia approves and enforces this law, it is quite possible that many priests will go to jail for contempt of court when they refuse to abide by it and will become more widespread if other governments attempt to follow this course of action. 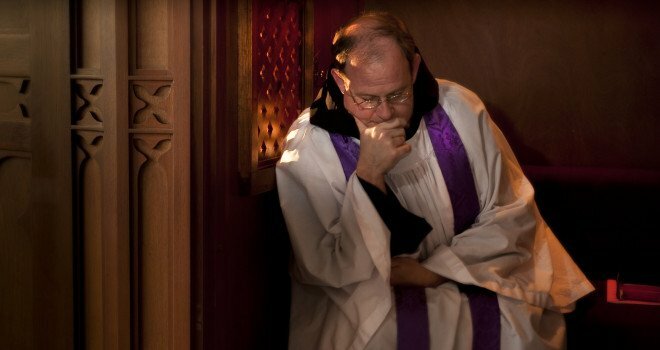 What exactly is the "Seal of Confession", how does it differ from professional-client confidentiality and why is it important to Catholics? "Amen, I say to you, whatever you bind on earth shall be bound in heaven, and whatever you loose on earth shall be loosed in heaven" (Mt. 18:18). With these words, Jesus conferred on the Apostles his ministry for the sacrament of Confession/Penance/Reconciliation (all essentially synonymous words for the same Sacrament of Healing). And, since the Apostles did not live on this earth forever, it was passed down through Apostolic succession to its ministers today: bishops and the priests under their authority. By making this connection between Heaven and such action taken by men on earth, Jesus gave this act a unique and sacred character; one that cannot be violated by anyone, even the minister of the sacrament acting in the person of Christ (in personae Christi)! What is quite remarkable is how canon 983 is stated in Latin when it uses the word "inviolable": the word nefas, which is translated "absolutely forbidden", actually has no direct translation in English. It refers to something that is so wickedly sinful that is simply impossible to do it! It is considered part of the sacramental grace conferred by the sacrament of Holy Orders that provides the supernatural ability to keep this promise. A confessor who directly violates the sacramental seal incurs a latae sententiae excommunication reserved to the Apostolic See; one who does so only indirectly is to be punished according to the gravity of the delict. (CIC 1388) A latae sententiae excommunication means that the cleric incurs the excommunication at the moment he commits the crime (as opposed to an excommunication which is imposed by a Church authority after it is investigated - a ferendae sententiae excommunication). This means that, not only is the offending cleric immediately barred from celebrating the sacraments, he is immediately excluded from receiving the sacraments - including Confession - until the excommunication is lifted! Not only that, unlike many other excommunications, which can be rescinded by the diocesan Bishop (or even by a priest in cases such as sins of directly procuring an abortion), it must be referred to and investigated by the Apostolic See - the Vatican - in order for the cleric can be considered for return to the celebration and reception of the sacraments! It is one of the harshest remedial measurements (not merely meant to be a punishment but one that requires repentance and healing) that can be carried out by the Church; how fortunate (for most of us) that it can be incurred only by bishops and priests! Continue to pray for our Church and the spiritual attacks that occur, both from without and through the weakness of members within. Pray in this time of trial for the faithful of God that we do not - as people and nations pursue the true and good search for justice - lose the gift of God's grace through the sacrament of Confession, which Christ has left to His Church for our salvation. Gifts from God is two excellent documentary films, one on the papacy titled Keys of the Kingdom: Understanding the Papacy, and the other titled Confession: The Forgotten Sacrament. Both films feature expert priests and theologians presenting in-depth commentary on these two sublime spiritual gifts from God to humanity through the Church, revealing the powerful spiritual significance of the papacy and confession for Catholics. Featured priests and teachers in this film include Fr. Thomas Crean (Author, God is No Delusion), Fr. Timothy Finigan, Steve Ray (Host, Footprints of God series), Joanna Bogle (Host of many EWTN series), and others. The compelling presentations of the teachers & priests in this film are interspersed with beautiful art work and inspiring graphics. These films will help Catholics, and others, to have better understanding and deeper appreciation for the gifts of the papacy and the sacrament of confession.